On December 19, 2018, the Florida Department of Education released graduation rates for the 2017/18 school year. Broward County Public Schools (BCPS) is proud to announce that the results show graduation rates for traditional District high schools (excluding centers and charter schools) reached the highest level in seven years, at 95.1 percent, which exceeds the 93.8 percent achieved in 2016/17. Additional highlights are listed below. 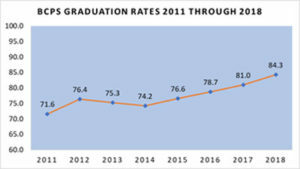 Broward County Public Schools (BCPS) achieved its highest graduation rate since Florida adopted the Federal Uniform Graduation Rate (includes traditional District high schools, centers and charter schools) method in 2010/11. BCPS Federal graduation rate is 84.3 percent for 2017/18, which is an increase of 3.3 percentage points from 2016/17 (81 percent). Black (79.4 percent, 4.4 percentage point increase from 2016/17), Hispanic (85.5 percent, 2.5 percentage point increase from 2016/17), and White (90.1 percent, 2.8 percentage point increase from 2016/17) students improved their graduation rates. Black students registered a greater improvement in graduation rate, closing the gap with White students by 1.6 percentage points. 31 of 35 traditional District high schools achieved a graduation rate of 90 percent or higher; 19 of these schools reached a graduation rate above 95 percent. 30 of 34 traditional District high schools improved or maintained their graduation rate from the prior year (Sheridan Technical High School did not have a graduation rate in 2016/17). Atlantic Technical High School, College Academy at Broward College and Lauderhill 6-12 achieved graduation rates of 100 percent for the second consecutive year. Piper High School increased its graduation rate by more than 5 percentage points for the second consecutive year. The following high schools also made significant increases in their graduation rates in 2017/18: Blanche Ely High School (93.8 percent, 3.5 percentage point increase from 2016/17), Deerfield Beach High School (93.5 percent, 3 percentage point increase from 2016/17), Hollywood Hills High School (97.9 percent, 4.3 percentage point increase from 2016/17) and Monarch High School (96.2 percent, 4 percentage point increase from 2016/17).